The Adobe ColdFusion application server allows developers to rapidly build, deploy, and maintain robust Internet applications for the enterprise. It is quite popular, and it’s associated scripting language–ColdFusion Markup Language (CFML)–has a vibrant and growing community behind it. 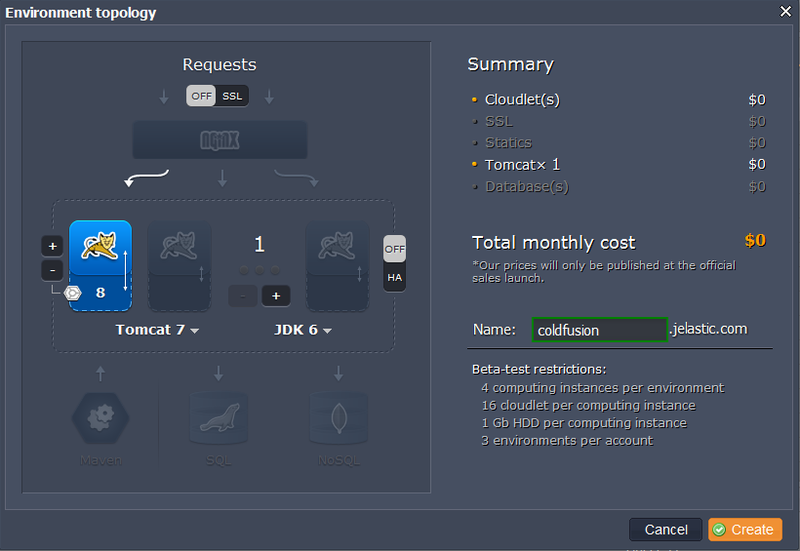 Let’s deploy ColdFusion (9.01) to the Jelastic cloud so you can see how easy it is! Go to jelastic.com and sign up if you haven’t done so yet, or log in with your Jelastic credentials by clicking the Sign In link on the page. Pick your application server (for example, Tomcat 7) and specify your environment name, for example, coldfusion. It will take just a second for your environment to be created. 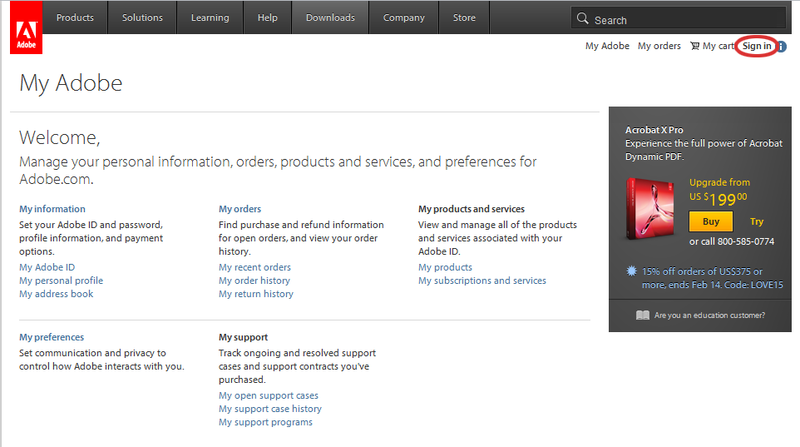 Go to adobe.com and sign up. 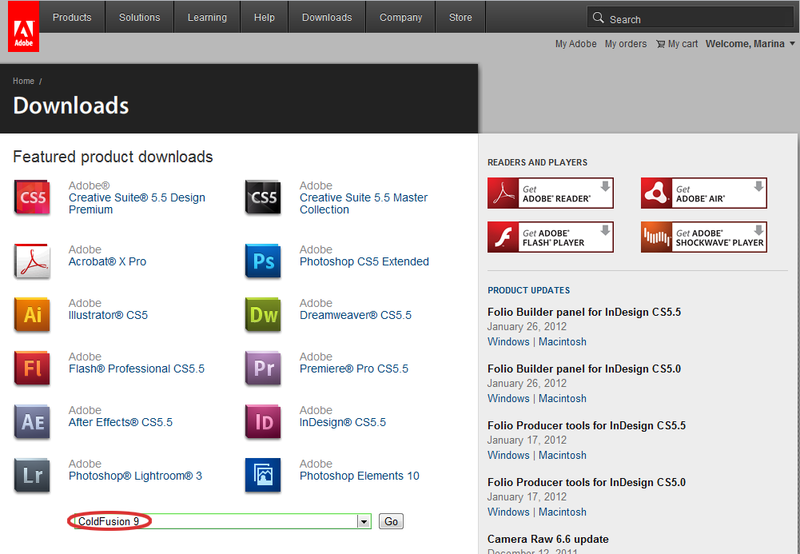 Select the Downloads tab, pick ColdFusion 9 from the list and click Go. Pick a suitable version for your OS and download it. Also download ColdFusion 9.0.1 update. 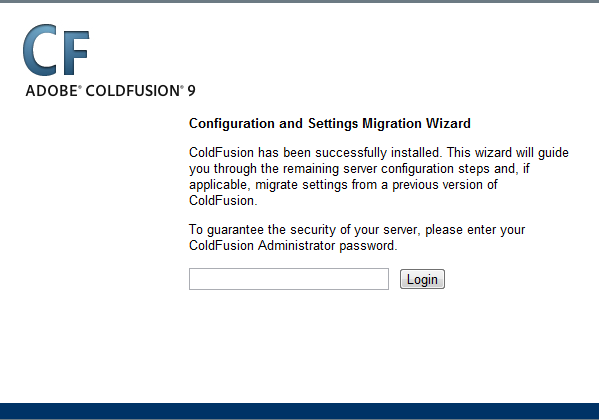 Run the ColdFusion 9 installer that you have just downloaded. Look through the Introduction and accept the terms of License Agreement. In the Installer Configuration window, select either the 30-day trial or Developer edition (if you don’t have a serial number). Then pick J2EE configuration with WAR file. 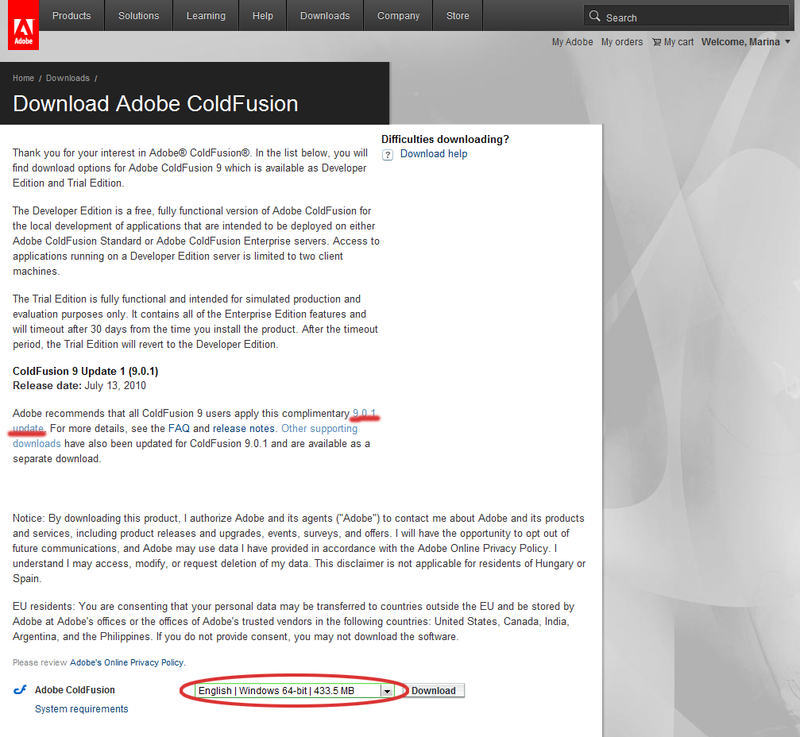 Select the components to install and the directory where you want to place ColdFusion. Enter the password for ColdFusion Administrator, then enable RDS if you wish. Review the pre-installation summary and click Install. 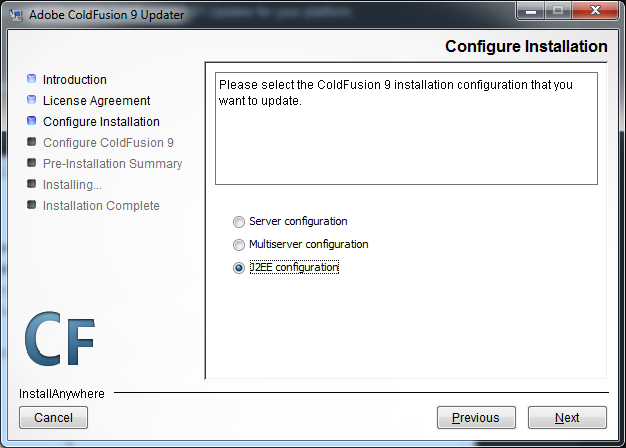 Once the installation process is finished, run the ColdFusion 9.0.1 updater. Read the Introduction and accept the License Agreement. 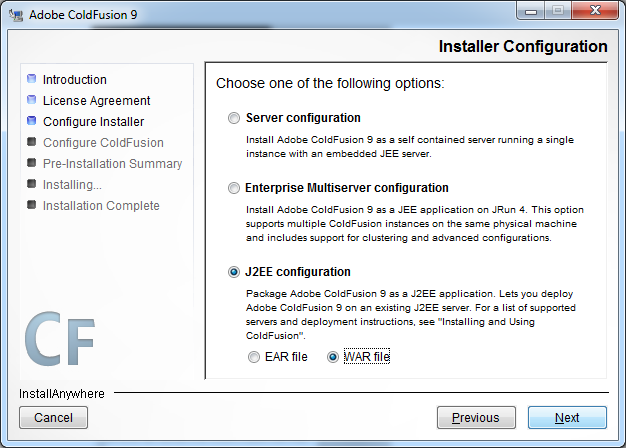 In the Configure Installation dialog select the configuration that you want to update: J2EE configuration. Look through the pre-installation summary and click Install. 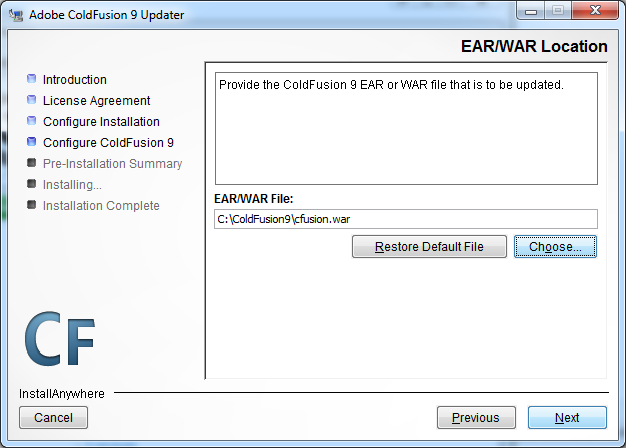 Once the update of the ColdFusion WAR is finished, upload this file to any online file storage system that you want. At the moment, while we are still in beta, the file is too big for Jelastic’s Deployment manager. Then upload WAR file to Jelastic via URL. Once the package is in dashboard, deploy it to the environment you created earlier. Now you can go and run the ColdFusion Administrator.